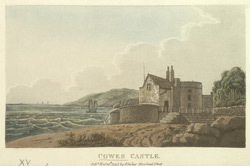 View of West Cowes Castle. The castle or blockhouse, is situated on the western bank of the river Medina on the northern coast of the Isle of Wight. The castle was built by King Henry VIII to protect the Island against a possible French invasion. It is though that it was the King’s Master Mason Thomas Bertie, who designed and built the castle. The castle was small with a semi circular gun platform and a two story round tower. In 1855 the lease of the castle was transferred to the Royal Yacht Squadron who added to the castle buildings.